Using gorjuss art without a valid license as set out below, is against the law. We will pursue and take any appropriate actions including legal action against users who use the artworks without the proper license/permissions. "Digital products" include all items from the Tubes/Licensing section of the Gorjussart shop and exclude any other items from the other sections of the shop. When you register at gorjussart,.com you will receive an automatic Welcome email to thank you for signing up, in this email you will also find your unique gorjuss art license number ( eg: SW 1234 ). Before registering it would be advisable to add sales@gorjussart.com and help@gorjussart.com email addresses to your allowed senders lists in any junk mail filtering software you have. In the unlikely event you dont receive this email, please first, check your spam folder, and if it's still not found you can find your license number by following these steps. 3. Click MY ACCOUNT tab at the top of the page. It will show your gorjuss digital license number at the top of the page, ONLY if you have made an order with our shop. The license is of no use unless you have purchased digital products from our shop, and will not show until you have made a purchase. Shopping for tubes has never been easier ! Just browse the site, the tubes are available individually, or in packs of 6, add what you wish to buy into your cart and checkout. Once you have checked out*, your purchases are available instantly to download from your Account area. To download your packs follow these steps. 4. Click VIEW button next to the orders. 5. Click DOWNLOAD buttons as required. *Please note if you paid via E-check/ echeque it may take up to 10 days to clear and your download to become available. All our Tubes are in .PNG format (this is compatible with most graphics programs) and on ONE layer, the tube itself is an image with no background ( ie. a girl with no background) .. we also include a copy of the full image too ( with a background), we place these side by side instead of on top of each other ( like other companies) Our preview images show the layout of the tubes, the checkered background indicating the transparent tube background. Scrapkits and element packs are also on one transparent layer ( i.e no background). *You may NOT TUBE gorjuss art without a license, if you have a license you may tube the image that is downloadable in Your Account area. If you tube this image it must be for your OWN personal use only, and must not be shared or distributed in anyway. *You may not use tubes obtained from elsewhere with your gorjuss ART license. *You may not print out any gorjuss art, even after you use it one of your own creations! * You may not supply anyone 'asking' for gorjuss art with our Tubes, all licensed users have their tubes available to them in their Account or are replenished quickly by ourselves via email. *Our copyright and YOUR license number must be ON every creation you make. We class each creation as per image... if your creation is made up of more than one image pieced together ( i.e a webpage that has buttons and a background) then each image must have the correct copyright AND license info included. Please try and spell Suzanne's name and the web address correctly! The credit and license code MUST be clearly legible on all of your creations, it's okay to use a fancy font, but please double check that it can be read! Small buttons and Avatars are NOT exempt from the copyright being present on them - we recommend searching for some mini fonts online for tiny but legible text ! * You may NOT put any other copyrights on any images that contain gorjuss art, if you must credit someone else you may put 'Scrapkit by - ' or 'stock photo by - ' .. but you may not mix gorjuss art with any other artists work requiring their relevant copyright credit. *You may not put any other web address on gorjuss art creations. We do allow you to make banners for your groups, but they should be 'clickable' and have the groups name only, not the address on them. * You may not pay or be paid for any image that contains gorjuss art, in any way, this includes your own gorjuss art creations - and this includes donations. Please remember your license covers personal use only. Personal use is deemed as any area where there is nothing 'for sale'.. please note we do not allow usage under a personal usage license for ebay listings/logos! It doesn't matter if you are not a company, don't SELL things using gorjuss artwork on the same site! If you want to use Gorjuss Artwork in a promotional or commercial way contact Santoro Graphics Ltd to make appropriate arrangements. *Your creations are for online use only, if you are found to be making creations that are clearly for offline/printable use, e.g party invites/ notepaper, then your license will be revoked and legal action may be taken. *You must not alter the images in any way, this includes but is not limited to painting over, tracing, adding to, or modifying. We allow animation! (yay!) but remember that you can NOT paint over or 'alter' the artwork (this means no blinking/waving etc!) We allow grayscaling and single hue changes of the WHOLE image, but not in 'part' ( i.e no changing the girls hair / dress colour!) This is to preserve the integrity of the artwork and help maintain its credibility. 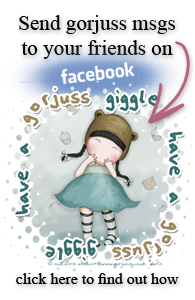 DONT add your own hats - hairclips - clothing - legs etc to the images! *Your creations must not show a gorjuss art image at over 550 pixels on the largest side, be careful of this when creating a desktop wallpaper! These packs are now sold as personal use only, no work for hire, no payments in exchange of creations, no donations, no use of your creations in your own shop designs/logos, ebay listings, etsy banners etc..
*Element packs bought from Artistic Minds Inc were never sold with a commercial usage license and should follow the TOU they received a copy of at time of purchase. Any AMI license you may hold is still valid, and will be for your lifetime. But AMI is now closed down and is unlikely to return to trading. Any License queries involving AMI licenses will need to be supported by paypal receipts that detail the packs purchased. You may find as you carry on purchasing tubes from us here at gorjuss art, you get a little confused over what license to use on your creation.. OR .. you want to use two images on your creation, one you hold a AMI license for, and one you hold a gorjuss art license for... You can use TWO license codes on one creation as long as they are both for Gorjuss images, If it becomes a bit messy and you would rather use just one then the trade - in is a good idea to solve the problem. The trade-in does NOT cancel or modify your previous purchases from AMI. 1. Your AMI License number. 3. Proof of the purchase of packs from AMI, whether this be confirmation letters from AMI or Paypal receipts, they do need to have the packs or tubes listed on them so that we can add these under your new license number. Email all this to help@gorjussart.com with subject "License Trade In" . If you are fwd'ing on multiple emails then dont worry ! Your request will be queued and dealt with ASAP - there may be a wait for these to be actioned, as we receive a lot of them! Due to time constraint we do NOT contact you to say we have received them - We will contact you if we require further information and also to let you know once it has been actioned. As soon as you receive the email confirming the packs/tubes now covered by your gorjussart license, you can then use your new license number on all specified AMI purchased packs/tubes. If you cannot provide proof of having purchased the pack then we will not be able to cover the images/tubes affected for use with the new Gorjuss Art Digital License number.